The B-52 was designed by Boeing Aircraft in October 1946 in response to the Army Air Corp request for a long range bomber capable of carrying a 10,000 lb payload 3000 miles at 300 mph. The B-52 flew for the first time on 15 April 1952. It’s the only aircraft in the world with eight jet engines. The first B-52A was delivered in 1954 and the last B-52H was delivered in October 1962, a total of 744 B-52s were built for the USAF. The B-52 has been the flagship bomber of the USAF for more than four decades. The Gulf War involved the longest strike mission in the history of aerial warfare when B-52s flew from Barksdale AFB, LA., launched conventional air launched cruise missiles over Iraq, and returned to base. A 35 hour non-stop combat mission. The B-52 is capable of dropping or launching the widest array of weapons in the US inventory. This includes gravity bombs, cluster bombs, precision guided missiles and joint direct attack munitions. Current analysis of the B-52 shows its lifespan to extend beyond the year 2040. 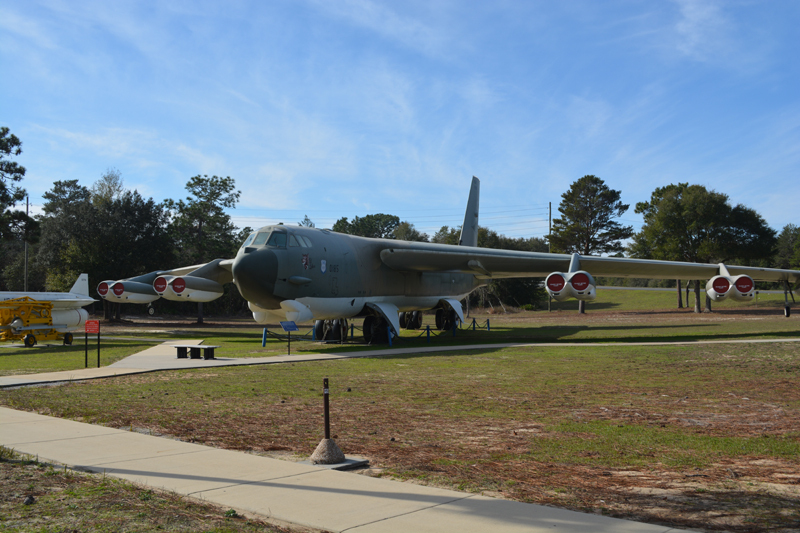 This B-52G S/N 58-0185 was first assigned to the 4135th Strategic Wing (SAC) at Eglin AFB, Fl in September 1959. It was last flown by the 2nd Bombardment Wing (SAC) at Barksdale AFB, LA. During its time at Barksdale AFB, this aircraft flew missions during Desert Storm. During Desert Storm the B-52s completed approximately 1,620 sorties, in fact, the B-52s managed to drop almost a third of the entire tonnage of bombs dropped by US aircraft.